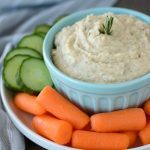 This easy White Bean Hummus with rosemary and thyme makes a delicious and healthy snack! Make it ahead and serve it with your choice of fresh veggies or pita chips! I just love the flavor of fresh rosemary with white beans. The earthy flavor compliments the beans so well and makes them taste incredibly delicious. I make my White Bean Hummus without tahini. I just don’t feel it’s absolutely necessary, and there’s one less ingredient to buy. Let’s just say this didn’t last long the first time I made it. My husband loved it and so did I. I served mine with raw veggies, but pita chips would be great with it, too. I think I liked it best with slices of English cucumber, but the celery was pretty good as well. What is White Bean Hummus Made Of? You can flavor it a variety of ways, but I like to keep it pretty simple. Mine is made with cannellini beans, garlic, fresh rosemary, thyme, lemon juice, salt, and pepper to taste and extra virgin olive oil. Place all of your ingredients into a food processor and pulse until creamy. Check seasonings, adjust if necessary, then refrigerate for at least an hour to let flavors marry. If you would like less garlic flavor, just use 1 garlic clove instead of two. You could also substitute some of the bean liquid for the water if you’d like. 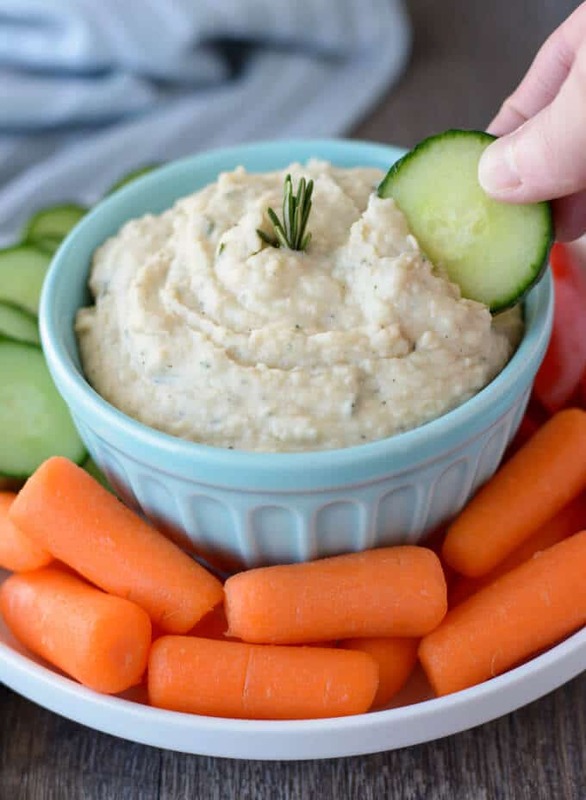 Save this White Bean Hummus Recipe to your “Snacks” Pinterest board! 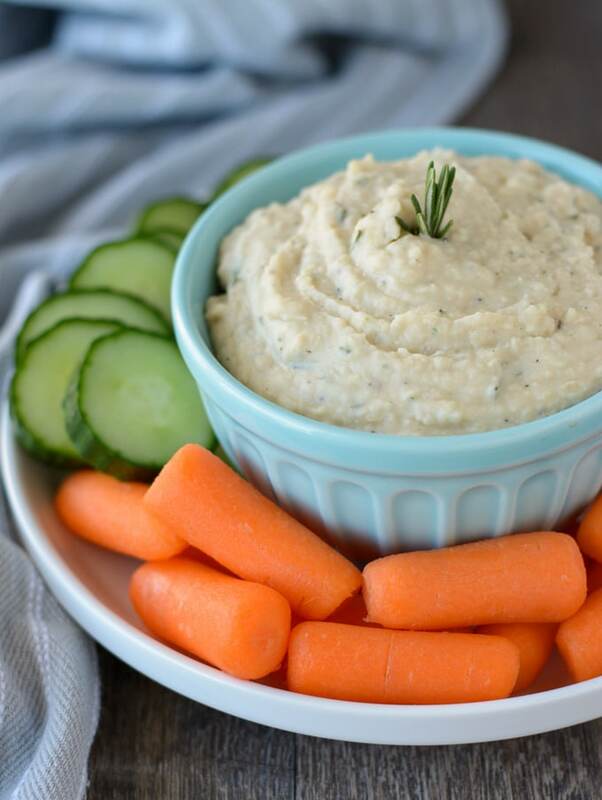 This White Bean Hummus is infused with the herby flavors of fresh rosemary and thyme. It makes an easy and healthy snack. Place all ingredients into the bowl of a food processor. Pulse until smooth and creamy. Transfer to a small bowl and serve with raw veggies or pita chips. 1.You can add an additional tablespoon of water if you'd like a thinner consistency. 2.For less garlic flavor, use 1 garlic clove instead of two. By Tempie at October 17, 2018 .